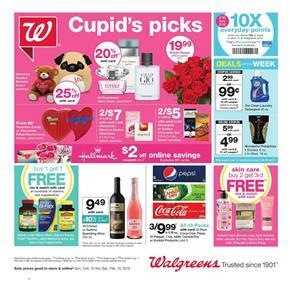 This is a preview of Walgreens Ad supermarket deals that cover snacks, cleaning supplies, online coupons, simple meals, and Valentine's Day treat or gifts. You can see the first 7 pages wherein you can see all these categories. You can get a $2 off Hallmark deal at Walgreens. Deals of the week are Oxi clean laundry detergent, Wonderful Pistachios that can be seen on the first page. Get 10x everyday points when you spend $20. See the gifts for Valentine's Day. The fragrance is one of the popular categories when it comes to gifts in the name romanticism. Most people think of buying packs of candies and chocolates as treats for a romantic night. I also find it wise to have some chocolate boxes around in days like this. Restock your cleaning supplies with the prices given on pg 2. Quilted Northern bath tissue, Bounty paper towels, Cottonelle bath tissue, and more are the featured deals of the new Walgreens Ad. Canned food variety that covers products like Spam, Bumble Bee pink salmon, Campbell's soup products is available on pg 4. Cooked and practical packaged simple meals are BOGO 50% off discount on pg 5. Walgreens has also a good range of snacks including Jack Link's Jerky, Planters nuts, Pringles, and more on pg 6. Even more Valentine's Day gifts and treats are available in the ad. Check out pg 7 for further information, follow our Facebook page to track the future deals from the Walgreens Ads.